It’s confusing out there in the world of protein supplements and nutrition. Hopefully we can clear up some of the information with this blog post. Part I will be about protein utilization and supplementation and Part II will be about Protein Energy Malnutrition (PEM). So let’s get started with the basics of protein utilization and metabolism. This will clarify what our goals are and what we need to achieve them. 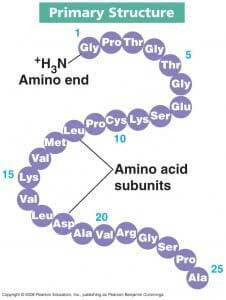 There are 23 Amino Acids (AA) that combine to form peptide chains. These peptide chains link together to make polypeptides, which are the building blocks of many proteins sources. These types of proteins are called proteinogenic. Nine of these proteinogenic AA’s are essential meaning that the human body cannot make them. They must be taken in by food sources. The other AA’s are considered non-essential because the body can produce these without an outside food sources. A complete protein contains all of the essential amino acids and an incomplete protein does not have all nine of the essential amino acids. Branched Chain Amino Acids (BCAA’s) are an incredibly important subgroup of the essential Amino Acids. Three of the nine essential AA’s are BCAA’s. They are leucine, isoleucine and valine. These three AA’s make up 40% of the protein required by humans. Muscle protein is made up of 35% of these three BCAA’s. Any protein supplement after weight loss surgery should contain these three amino acids, Isoleucine, Leucine and Valine. Protein breakdown begins in the stomach with the addition of enzymes and acid then continues into the small bowel where absorption takes place. Protein must be broken down by these enzymes and acid to single Amino Acids or peptide chains no longer the 4 AA’s in order for the intestinal absorptive cells to absorb the protein. The 4 chain peptide chains are further broken down within the intestinal absorptive cells. Protein absorption takes place easily but the most important factor is protein utilization. Protein utilization is how much of the protein ingested is actually utilized by the body. The body may absorb a great deal of a protein food source but can only utilize about 30-40g of a high quality protein source at a time. The body does not store protein as it does with other nutrients. Therefore, whatever the body doesn’t utilize is metabolize through the liver and converted to urea. Urea is excreted through the kidneys via urine. Reduced protein absorption is why Bioavailability or Biological Value (BV) is so important when deciding on a protein source. Biological Value is the measure of how efficiently the body utilizes the protein from the food source. You will find this BV number on some protein supplemental products. The higher the BV numbers the better utilization of the protein source by the body. Whey protein and egg protein are considered the highest BV. The daily requirements of protein are 0.80 gram of protein per kilogram of ideal body weight calculating to approximately 50-65 grams a day. 3 However, after weight loss surgery (WLS) a person should get 80-100 grams per day, 1 gram per kilogram of weight and in some cases even higher amounts of protein. Protein Supplements: First clarify the terminology in supplements. Isolate: Is chemically purified to 90% pure protein. 100g scoop=90g protein intake. Isolates have a High BV rate. Concentrate: 35-80% protein 100g scoop=35-80g protein intake Also contains fat, carbohydrates and in the case of Whey Concentrate, lactose. Concentrates have a high BV rate. Blends: Combination of protein sources and purity levels. Varies in how many grams of protein are available in each product. They are lower in cost and quality in some cases. Blends have a medium/high BV rate. Hydrolysate: enzymatically predigested for maximal speed of absorption and utilization. Very water-soluble but can have a bitter taste. Hydrolysates are high in cost and BV rate. Branched Chain Amino Acids: contains the 3 essential AA Leucine, Isoleucine, and Valine that make up 1/3 of skeletal muscle and are vital in protein synthesis. Easily absorbed and utilized by the body. BCAA’s have a high BV rate and cost. Animal proteins contain the 9 essential amino acids the body needs for skeletal muscle formation. It’s important to note that high fat in protein will decrease the amount of absorption and, therefore, utilization of protein due to altered anatomy after DS. Whey Protein is a byproduct of cheese production. It has a high BV rate and is the most popular protein supplement. It is rich in muscle essential amino acids and has a fast digestion rate. It needs to be taken more often because the ease of digestion. It contains 5% lactose within the product. Whey products come in a wide variety of flavors and styles. Unflavored protein products can be added to other protein foods, such as yogurt, cottage cheese, etc. to increase the protein. Be wary of artificial sweeteners in protein supplements as they can give you unwanted side effects, such as gas or loose stool. Whey Protein Isolate: (WPI) has one of the highest BV rates 104. WPI can be slightly more expensive but seems to be the most tolerated by WLS (weight loss surgery) patients. There are many flavors and styles with less fat and lactose than other whey protein products. Whey Protein Concentrate: has a high BV rate 85-90. Concentrate has more fat and lactose, which may not be well tolerated by WLS patients. Whey Protein Blends: Blends contain a mixture of both isolate and concentrate whey proteins. Which means the BV rate is higher than concentrate on it’s own. Because of increased fat and lactose this too may not be tolerated as well by WLS patients. Casein Protein is a milk protein and has a BV rate of 91. Casein is the trigger in most milk allergies. It is more slowly digested and more filling than whey protein. It may be more difficult to tolerate after WLS. Egg Albumin is very high in essential and nonessential AA’s. Eggs are also a great natural food source for protein. Does not have lactose but some people do have egg allergies. It is a cost effective source of protein. Supplement powders come in several flavors. This is probably nature’s perfect protein source with the highest utilization. Goat Milk: One of the highest BCAA available food sources. Is better tolerated by people with lactose intolerance. Beef, poultry, fish all have varied degrees of bioavailability. Please see the table above regarding each items BV rate. While beef may have a higher BV rate there may be other issues to deal with higher fat content that goes along with eating most cuts of beef. After DS higher fat content can mean looser stool or even diarrhea. Plant Protein may contain most or all essential amino acids but the amount is far less thank other protein sources particularly in the amounts of BCAA needed for skeletal muscle formation. It is best to combine or vary plant proteins to ensure adequate protein nutrition. Soy Protein: has a BV rate of 74. It is fast digesting, lactose free and comes in a variety of flavors and unflavored. It is also cost effective and contains all the essential AA’s. Soy beans are commonly a GMO crop, so if that is concerning look for organic sources. Soy is also a high allergen food and can inhibit calcium absorbtion. Pea Protein: 100% gluten free and lactose free. Pea protein is very easy to digest, rich in Amino Acids and is a high satiety protein. Pea Protein can be found with high levels of carbohydrate and low levels of carbohydrates. After WLS always choose lower levels of carbohydrates. Brown Rice Isolate: BV of 70-80. Is easily digested and is a good vegan choice. Again with Brown Rice Isolate watch your carbohydrate content. Brown Rice Isolate can be chalky in texture. Pea/Brown Rice Isolate: BV of 70-90 Combining these two gives a good profile of BCAA that rivals whey and egg proteins. It is easily digestible without allergy issues. When used in combination, rice protein and yellow pea protein offer a Protein Efficiency Ratio and BCAA’s that is comparable to dairy and egg. In addition, the texture of pea protein helps the chalkiness of rice protein. Spirulina: Blue-green algae is easily digested and high in AA 80-95% of proteins can be digested. BUT is very allergic prone. It is also expensive and the taste can be hard to handle. Hemp Protein: 30-50 BV rate. Hemp contains 21 amino acids and is considered a complete protein. The proteins in Hemp seeds are easily digestible, absorbed and utilized by the body. Hemp seeds are great to add to natural food products to increase protein and essential fatty acids. It is vegan friendly and low allergy rating. So what does this all mean? It is important when looking for a protein supplement or natural food source to look for the highest bioavailable rating and BCAA levels. Most protein supplements have these listed on their labels. Read the labels on supplements to find low fat, carbohydrate and lactose for best tolerance after WLS. Consuming high amounts of fat after duodenal switch decreases the absorptive time the food products due to the altered anatomy after DS. When taking your protein it is best for absorption to have low fat to optimize your protein absorption. Be wary of artificial sweeteners in protein product. They may also cause WLS patient issues, such as increased loose stools or gas. Also, try getting trial sizes of several different supplements to see how your body tolerates the supplement and your taste. If you are not tolerating one brand of supplements try another. Isolate, Egg or Blends are best tolerated after WLS and give the highest bioavailability. The best routine of taking your supplements after WLS is on an empty stomach in the morning or when you first wake. This is a good time to use an isolate, or blend supplement shake or natural food source such as egg. Have a midmorning protein snack or shake, lunch with high protein foods, a mid afternoon protein snack or shake, dinner of high quality protein and after dinner or as close to bedtime as you can tolerate protein supplement shake. For your meals choose the best BV rating food and also listen to what your body tolerate. Your natural food sources should be low fat, low carbohydrate and low lactose food choices. Also consider adding one of the plant protein supplements or unflavored animal supplements to your natural food sources to give an additional protein boost. The unflavored varieties can be added to nearly any food or recipe. Take care in adding protein powders to higher temperature foods, as high temperatures destroy the proteins. The key is frequent small meals and snacks with the highest quality protein. Varying your protein sources increases your chances of absorbing a variety of amino acids and nutrients. After surgery, you should expect to be able to consume the same amount of grams of protein as the number of days post op that you are. i.e. ; 30 grams of protein at the end of the first month, 60 grams of protein by 60 days post op, etc. Treat your body as you would an infant just starting to eat new foods. Try small amounts of food and only progress with a new item after several days of tolerating an old food. As always follow your surgeon’s guidelines and recommended diet. Do not progress until your surgeon has given you the go ahead.